These goodies are a natural treat for those times when you need to relax or simply reward yourself and take a long bath. They are a solid bath oil that leaves the skin feeling soft and oiled. So you should not need to add any products to your skin after you leave the bathroom. Scroll down and pick a scent to compliment the chocolate aroma that will refresh, stimulate, cause you to wind down or to encourage sleep. Please note that care should be taken when entering and exiting the bath as the melts cause the bath to become more slippery. 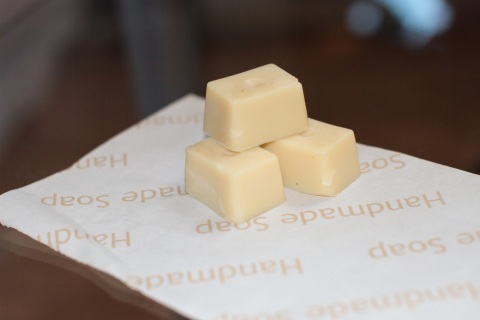 The Hyssop Bath Melt is the first product in our Gold, Frankincense and Myrrh Range. Known as a Biblical herb to purge or cleanse. Hyssop has warming and calming qualities, it is known to help respiratory infections and improve various skin conditions. Sold as a set of 3. Frankincense, one of the gifts given to Baby Jesus makes a warming and soothing oil with a pleasant and rich scent. Frankincense has a sedative and calming effect. It is excellent for mature skin and will leave people asking what is that smell? (In a positive way) Sold as a set of 3. Myrrh is another gift given to Baby Jesus by the Wise Men. The oil is excellent for most ailments including healing wounds, cracked skin, scars and eczema. It is not recommended for use during pregnancy. Myrrh has a therapeutic scent. Sold as a set of 3. Peppermint Bath Melt is stimulating and invigorating, helps to tone and improve the condition and appearance of the skin. If you are looking for something soothing and can help clear the respirator tract, relieve minor pains then this is the one for you. Sold as a set of 3. Our sweetest smelling bath melt is Geranium offering users a relaxing and uplifting affect. It helps soothe minor pains and aids in the relief of stress and anxiety. Geranium is known to balance the skin, fade scars and gives the skin a firmer and clearer appearance. Not recommended for use during pregnancy. Sold as a set of 3. Fabulous Lavender, with its sedative affect this is one to taken in the bath with a glass of water for the long pre-bed soak. Not recommended for use during pregnancy. Sold as a set of 3. One for the boys with its more masculine scent! Although us girls can use it too. Bergamot is fresh and stimulating which aids in soothing and calming the nerves and is known to help with minor germs and fungi on the skin. Sold as a set of 3. 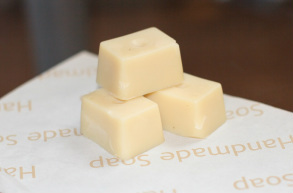 Patchouli is good for soothing the symptoms of Psoriasis and Eczema. It helps to reduce the time it takes to heal cuts and it has been reported to fade scars. Our Nut Free alternative is made with Organic Olive Oil. Sold as a set of 3.